I've not told anyone this before. For my 11th birthday I really wanted tickets to see Culture Club in concert at the Sydney Entertainment Centre. The band was riding high in the charts in 1984 with Colour by Numbers, my dad was grooving to Karma Chameleon and all seemed to be right with the world. Instead, we went to the revolving restaurant at the top of Centrepoint Tower in Sydney and had dinner. I sat patiently until dessert was served waiting for the tickets to emerge, but sadly they didn't. I don't remember anything about the food we ate that night, but I do remember getting lost finding my way back to the table after going to the loo thanks to that rotation. That and disappointment at having no tickets to see Boy George. As a result, eating at a great height always comes with a tinge of trepidation for me. So it was in that frame of mind that I stepped into the glass elevator and hurtled upwards to the 40th floor to Duck & Waffle. D&W has created a bit of a stir since it opened in the Heron Tower not too long ago, but from the outset I wasn't in a hurry to check it out despite it being near to where I work. D&W seemed to specialise in, shall we say, interesting food combinations. 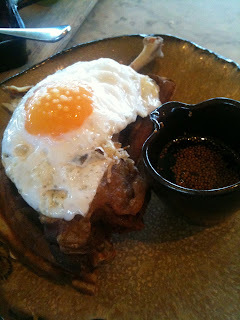 The titular D&W (waffle, confit duck leg, fried duck egg with a side of mustard maple syrup) or the All Day Breakfast (foie gras, nutella, brioche, rice crispies, pork dust) sounded like lardy abominations to me. Weeks of twitter buzz and a theatre date at the Menier Chocolate Factory one recent Friday meant that D&W would be a good pre-theatre option, so I made a booking. Adjusting to the height and the incredible view at the top of the tower, I was told by the maitre d' that I didn't actually have a booking. I grabbed a cocktail (G&T with yuzu at £11, ouch!) while they looked into it. It turned out that the person I spoke to earlier in the day had booked a table for 5.45pm the following Friday. It was not a problem though, and we were shown to a table in the largely empty restaurant, which stayed that way through most of the time we spent there. We started with two classics: the crispy BBQ pigs ears and the fried cod tongues. 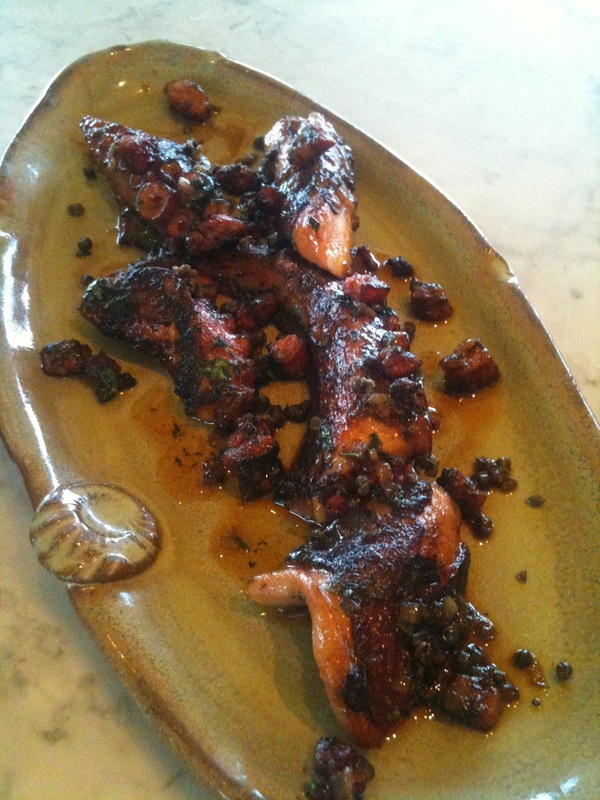 The curly strips of fried ear were coated in a tangy, salty mix of spices which will make your tongue and lips tingle. This was pork crackling on crack. The cod tongues were battered, deep fried, springy little morsels served with a tart little tartar sauce. 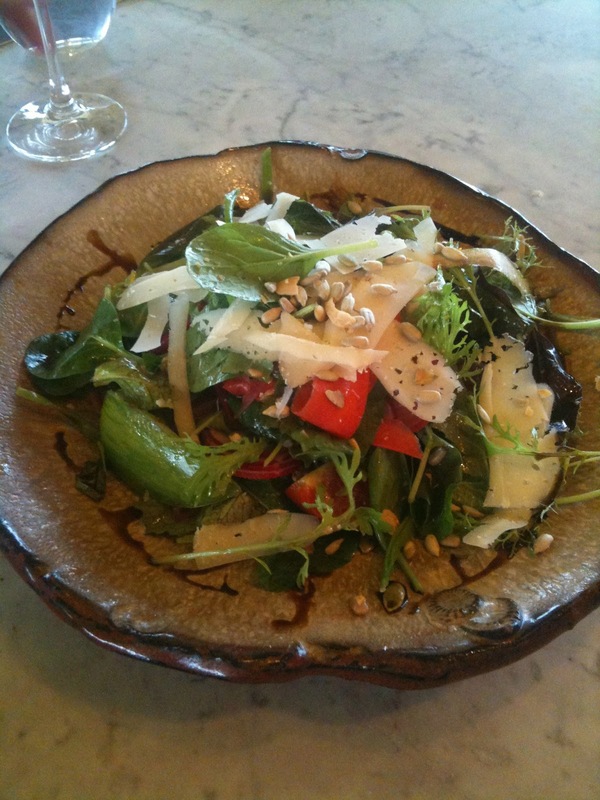 These were both great dishes. The rest of food came at various intervals but we didn't feel particularly rushed. 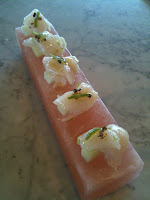 The scallops were served sashimi style on a stick of Himalayan salt, with apple and black truffle. Our waitress told us to eat this with our fingers, rubbing the scallop on the salt plinth to flavour it. Perhaps straight after the BBQ pig ears was not the best time to eat another salty dish but I couldn't taste any of the black truffle. The apple was a nice touch though. 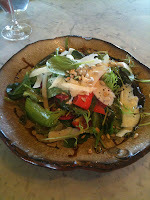 The lovely summer salad was a beautifully dressed, light and textural dish of crunchy leaves of various flavours. We also had a great smokey octopus tentacle served with cubes of fried chorizo and given some zing with capers and lemon. I was slightly confused by the roasted Essex beetroot which was described as being served with honey, goat curd and watercress. The honey turned out to be honeycomb, which just got clagged in my teeth on the first bite. 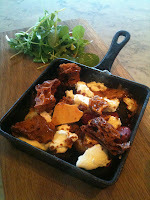 As the honeycomb melted in its warm dish however the combination made much more sense. I avoided the All Day Breakfast (I'm still not convinced) and instead saved room for the D&W dish. This was a surprisingly great but familiar combination to me. It reminded me of my years living in Amsterdam and eating pannekoeken met spek, or pancakes layered with strips of bacon which I would then drown in maple syrup. The sticky and sweet balancing the fatty and salty. I hear your stomach churn a bit, but don't knock it until you've tried it. The D&W version is a bit more refined with the fried duck egg and the beautiful tender confit duck but the essence is still there. So the food at D&W was surprisingly great and on the whole the combinations worked well together, but I felt like the staff were trying to up-sell us on most of the menu. We ordered seven dishes in total, but our waitress thought we should order more (we were obviously stuffed by the end). We were also asked if we wanted to order more wine, despite still having half full glasses. I'm not sure if this was just down to the very high staff-to-patron ratio at that hour and they were just looking for something to do, or they were trying to pad their 12.5%. In any case, it got annoying. Speaking of wines, there was not much choice in terms of wine by the glass. I'm not sure I know too many people who would pay £18 or £25 for a glass of vino (these are actual prices). At the lower end of the scale I opted for a US Riesling which was all sparkling apple juice and a Portuguese red which left little impression at all. In the end, we ended up paying more for booze than we did for food which either means the food is pretty cheap (actually, it is good value) or the wine prices are, shall we say, optimistic. So it seems that eating at a height still comes with some torment for me. The pushy service almost got the best of us, but the great food and the incredible view softened me. I'd definitely return to D&W to try out other dishes from the extensive menu, putting my mouth comfortably in the hands of the very capable kitchen. Perhaps I'll just skip the booze though and have an enjoyable dry meal instead. Oh and if you've made it this far, the family got to watch the Culture Club concert on the telly. It was amazing with the Boy descending from the heavens in a flashing heart-shaped vessel! It wasn't such a bad 11th year after all.